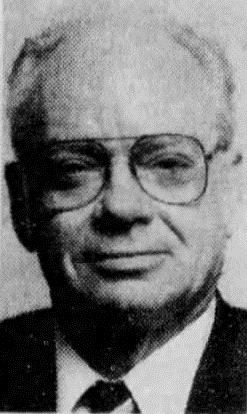 Des Moines Register, "Gosch: Ring of pedophiles took Johnny", 1991/07/18 (pages 1, 18) wrote: [Noreen] Gosch said Stephens told her the same ring may be involved in other kidnappings in the region, including the suspected abduction of Des Moines Register carrier Eugene Martin, 13, in south Des Moines in 1984, and more recently, that of Jacob Wetterling in St. Joseph, Minn.
EIR, "The Franklin coverup: child abuse, Satanism, and murder in Nebraska", 1994/03/04 wrote: As we investigated further, we learned a lot more and finally got a couple of people to infiltrate this network of kids, who operated primarily out of Madison, Wisconsin and Council Bluffs, Iowa. They were the kidnapped kids-or at least that's what they claimed-and the bad news is, they weren't the sweet, innocent children they were when they were kidnapped. They were simply perpetrators, exactly like the people who had done it in the first place. How was Jacob Wetterling involved? Jimmy, and at least two of the others, had absolutely assured us that Jacob Wetterling was part of the group. We believe we've had people physically present on two occasions when Jacob was there under another name. Why don't they come forward? Why can't you grab them? The Gosches were ready to do exactly that. Noreen Gosch, Why Johnny Can't Come Home, p.108 wrote: Bonacci told me, that in October 1989, he received a letter from "Mike"... telling that Emilio and "Charlie" had gone to "Minnesota to get another kid", It was just a week later Jacob Wetterling was kidnapped. I've shown this to many people and they all concurred that the middle, right, or a combination of both sketches looks quite like Kerr. Finally, former NYPD detective Jim Rothstein, who works human trafficking cases and has helped out Noreen, informed me that another Gosch abductor was also in Minnesota around the time of Jacob's kidnapping. His name is Sam Soda, a private investigator who tried inserting himself into Noreen's investigation, and was ultimately identified by Bonacci as the man who brought Johnny's photo to the kidnappers saying that was the kid they were going to take. According to Rothstein, Sam was in St. Cloud working for the Ruan trucking company at the Fingerhut store. In an interview Sam gave with the Faded Out podcast (which I find to be mostly disinformation), he freely spoke about doing work for Ruan, partially corroborating Rothstein's information after the fact. Timothy Charles Holmseth, "Recovery of Jacob Wetterling’s remains a false and fabricated story? ", 2017/07/15 wrote: Observe the following from the first search warrant executed on August 31, 2016 that states Heinrich accompanied officers to a site where bones and teeth were found. It said, “Later examination by experts determined neither the teeth nor bones were human”. On August 31, 2016 a search warrant was executed at 27725 Business 23 East Paynesville Stearns County. 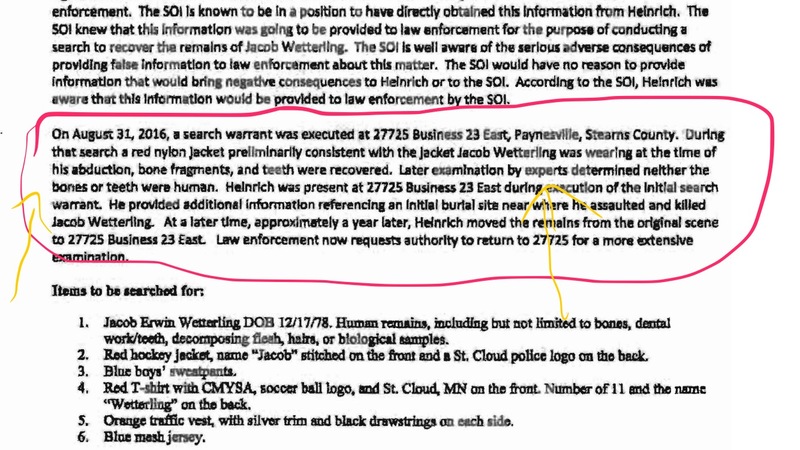 During that search a red nylon jacket preliminary consistent with the jacket Jacob Wetterling was wearing at the time of his abduction, bone fragments, and teeth were recovered. Later examination by experts determined neither the teeth nor bones were human. Heinrich was present at 27725 23 East during the execution of the initial search warrant. He provided additional information referencing an initial burial site near where he assaulted and killed Jacob Wetterling. At a later time, approximately a year later, Heinrich moved the remains from the original scene 27725 Business 23 East. Law enforcement now request authority to return to 27725 for more extensive examination. 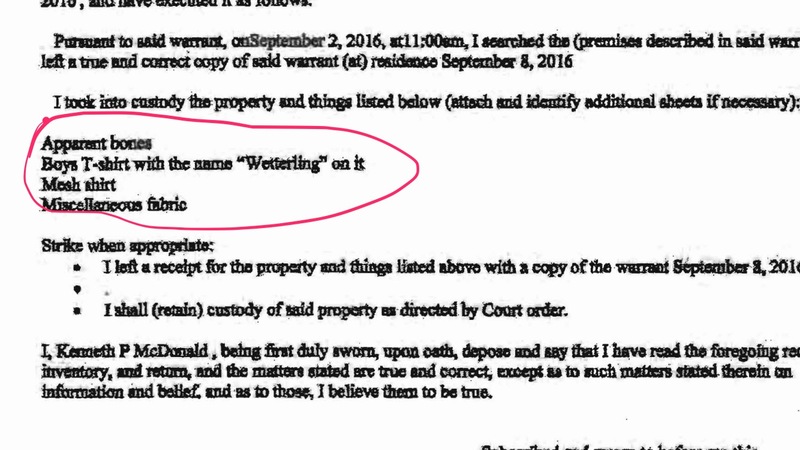 The August 31, 2016 warrant makes reference to Heinrich mentioning an “initial burial site” during the search - and Heinrich claiming he “moved the remains from the original scene 27725 Business 23 East ”. For some reason, the officer then requests a second warrant, which is simply a request to return to the address of the first warrant. Law enforcement is going to search the same place twice while mentioning ‘two’ sites. On September 2, 2016, law enforcement conducted a second search. Yes, you read right – “apparent bones”. Remember – the teeth and bones found the first time (at the same site) were determined by experts to not be human. So was it the animal bones found during the first search? Or the "apparent bones" during the second. And by the way - where is a mention of Jacob's skull (where teeth are found)? On August 31, the police go to Danny Heinrich's property, where Jacob is supposed to be buried. They dig up a red jacket that seems like the one he was wearing at the time of his abduction, along with well as bones and teeth. It is not immediately obvious that the bones and teeth are non-human; that has to be determined through "later examination by experts". Then the police go back a couple days later to do another search. During this search, they find Jacob's clothing as well as some vaguely-described "apparent bones". Shortly after that, they allegedly perform a dental match of the remains to Jacob Wetterling. But where did the teeth come from to make that comparison? The second search warrant does not specify that teeth, a skull, a jaw, etc. was found; the police didn't specify anything beyond "apparent bones", indicating they did not find anything obvious enough to be more specific. In contrast, the first search warrant is very specific about finding teeth, but they're animal teeth. This whole weird situation, especially with the earlier set of remains that seemed promising but were only ruled out later, certainly seems consistent with a fake body being planted like Rothstein told me. Given the evidence of a Franklin connection and the questionable confession of Danny Heinrich, it is quite possible that Jacob could still be out there, in the same way Noreen Gosch claims her son Johnny is.